A couple weeks ago, with Ruben’s help, we removed the last of the tangelo tree from our front yard. We are going to plant another, smaller, tree, but are waiting until the fall. In the meantime, we decided today to plant some summer grub. And this is what we got: 1) one regular red tomato, 2) one yellow cherry tomato, 3) two eggplants, 4) two different zucchinis, 5) one habanero chili pepper, 6) one serrano chili pepper, 7) one anaheim chili pepper, 8) two basils. 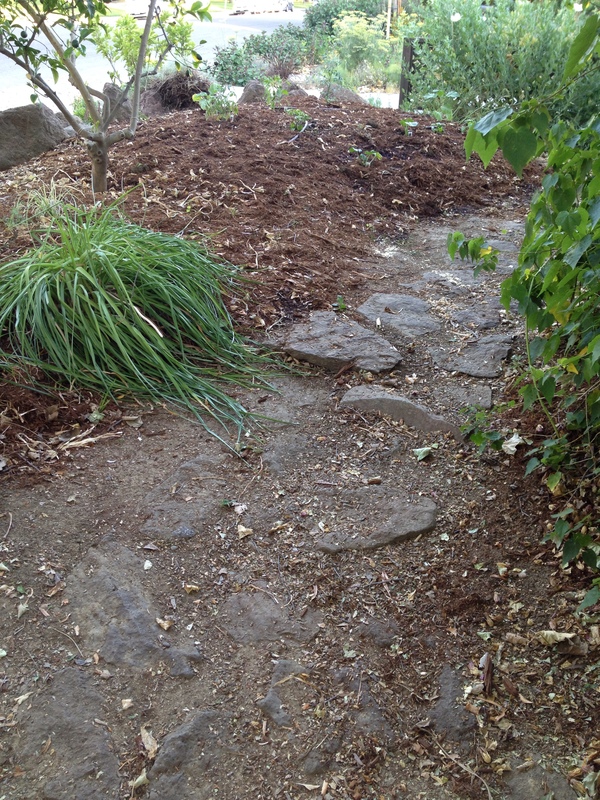 I finally decided it was time to clear the weeds that are growing in our sidewalk cracks. 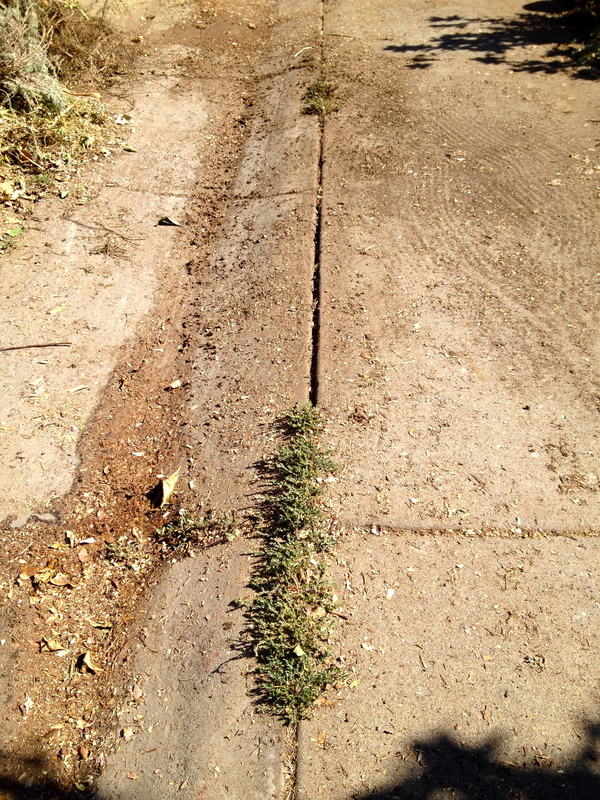 We are definitely bringing the neighborhood down with these weeds… we are looking very low-rent here at 609. 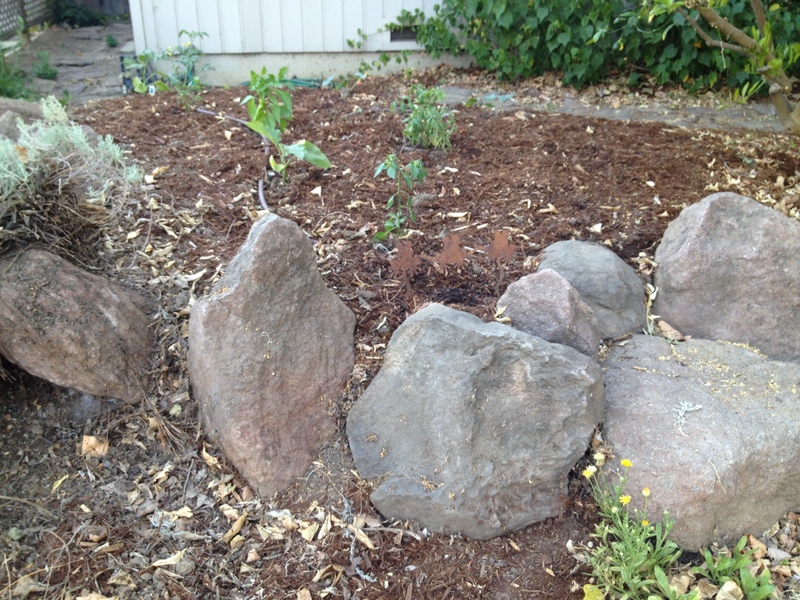 Which is ridiculous for all the work Frances and I put into the yard… so.. I went at it. But those guys are deep and hard to get. Other people probably use Round Up or a torch or something. I’m using this wonderful claw-on-a-stick that Jim made for this purpose. And it’s so clever, I think I’ll have him finish the job… because the above is as far as I got. It’s all muddy because my other great idea was to soak the weeds so the dirt would soften and the weeds would come out easier. I think all I did was provide water for the weeds so they’ll propagate more readily. As a side note: I was so spent after my 4+ hours out there, I retreated to the backyard hammock and lay there for about three hours. The hammock’s nearly a daily thing so far this summer and I’m getting it down: I lay a camping pad over the hammock for softness, put a pillow down for my head (that was today’s new addition), set up a short stool next to me for my book, iPad, iPhone and something to drink. I’ve rigged a rope between the hammock and a nearby tree which I use to get optimal swing. Then… I alternate activities: play Spider on my iPad while listening to music on my iPhone, or check Facebook on either device while listening to music, or read, or make calls, or text people. All while swinging in the shade. One of these days, I’ll be successful with the nap thing. Probably not ’til I’m 80. But I’ll keep working at it. I was so happy, I about cried.